We said goodbye to Ballathie House at the start of Day 3 to cycle 74km to Kenmore. After passing through Murthly we crossed the River Tay and started a climb into the hills at Caputh. We wound our way through hilly farmland and into the woods until we reached Loch of Lowes, where we took a break at the Loch of Lowes Wildlife Centre. 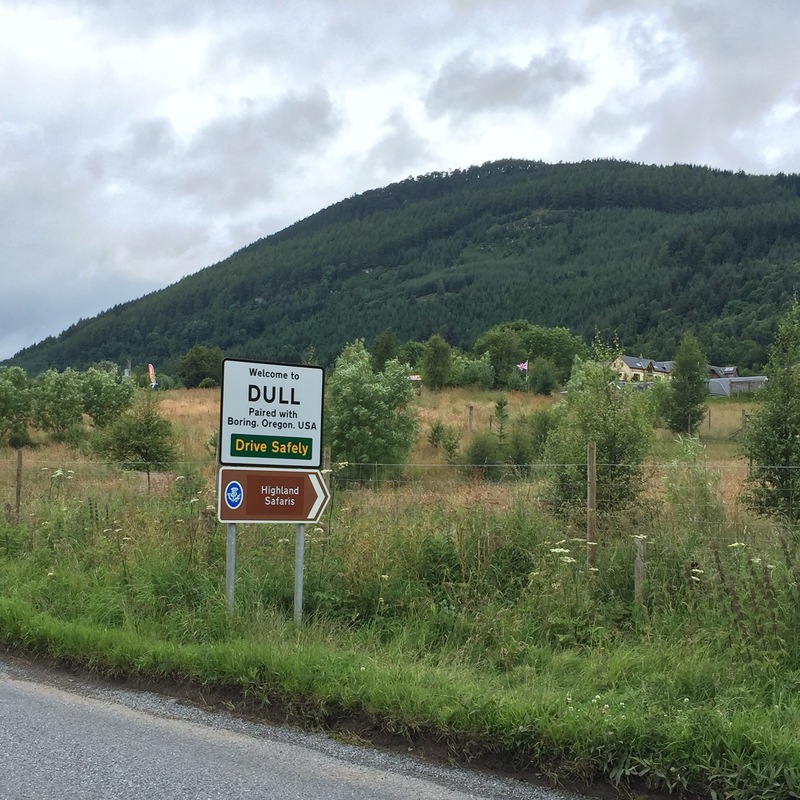 After a short, steep climb it was all downhill from there – literally – to Dunkeld. We spent an hour exploring town, especially the Dunkeld Cathedral. Built between 1260 and 1501, half the cathedral is in ruins making it a fascinating place to explore. We were there during Sunday mass, so we couldn’t take a quick look inside without staying for the service. 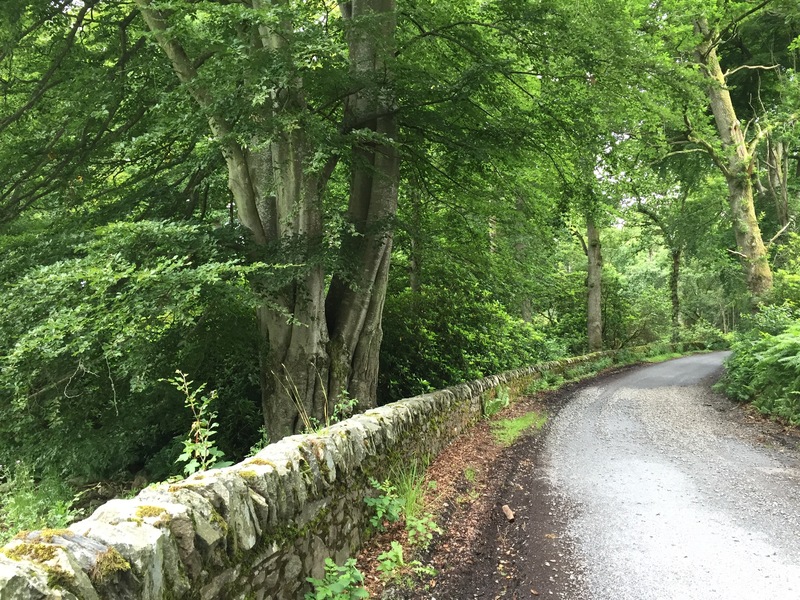 With rain clouds looming overhead, we left Dunkeld earlier than scheduled and cycled along a forested cycle path that ran through the property of the nearby Hilton hotel. We then crossed over the River Tay and cycled several miles along the river to Grandtully. During this stretch my friend and I came across the support van parked on the road. As we rode by, one of our tour guides asked us to hold up for a minute. My friend’s brother had taken a “bit of a tumble” and was about to be taken to the nearest emergency room to get “checked out”. While her brother suspected he broke his collar bone, he was so calm and philosophical about the whole incident that my friend accepted his insistence that we continue our ride. Turns out his collar bone wasn’t broken – only dislocated – and the fall was quite spectacular. Fortunately, his helmet did its job. Good thing we didn’t see it at the time! Always wear your helmet, folks. 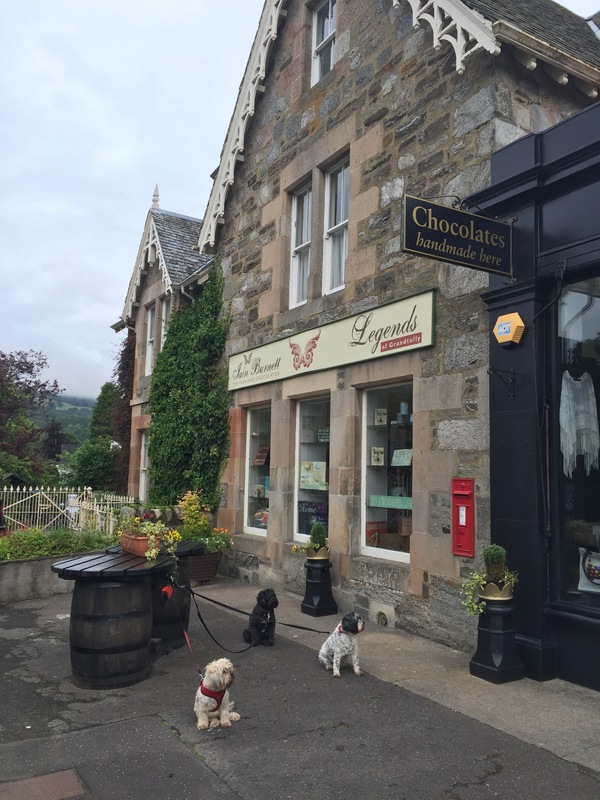 Our spirits were dampened out of concern for my friend’s brother as we rode into Grandtully, meeting the rest of the group at Iain Burnett, Highland Chocolatier, for lunch. Fortified with some tea and quiche, we bought chocolate for our loved ones before getting back on the road to Kenmore. We followed the River Tay to charming Weem, where a local couple assured us that Kenmore was only a few more miles down the road. However, they didn’t know we were planning on taking the longer route. We passed by Menzies Castle and the town of Dull. With a safari park and paintball, Dull seemed more exciting than you would expect. By this point, no one else in the group who left Grandtully after us had passed us, so we were feeling pretty good about our pace. Even with the threat of rain, we stuck to our plan to take the longer, more scenic route. We cycled through the green valley to Fortingall, where the church is home to Europe’s oldest living Yew tree root ball, which has been supporting new growth of yew branches for 5000 years! The church was an unofficial meeting point for the group, so when we didn’t see any other cyclists, we took our time exploring the little town around the church, the cemetery and the church itself. When no one else stopped or rode by, we headed back out on to the road thinking we somehow missed another stop and were now at the front of the group. We continued down into Loch Tay Valley and headed towards Kenmore. About 3 miles from the inn, the support van passed us, going in the opposite direction. A couple of minutes later, it passed us again going back to the inn. That meant we were at the back of the group! How could that be? No one passed us and we weren’t the last to leave Grandtully. We arrived in Kenmore nearly an hour after everyone else! We found out that everyone behind us avoided the rain and took the short route to the inn. 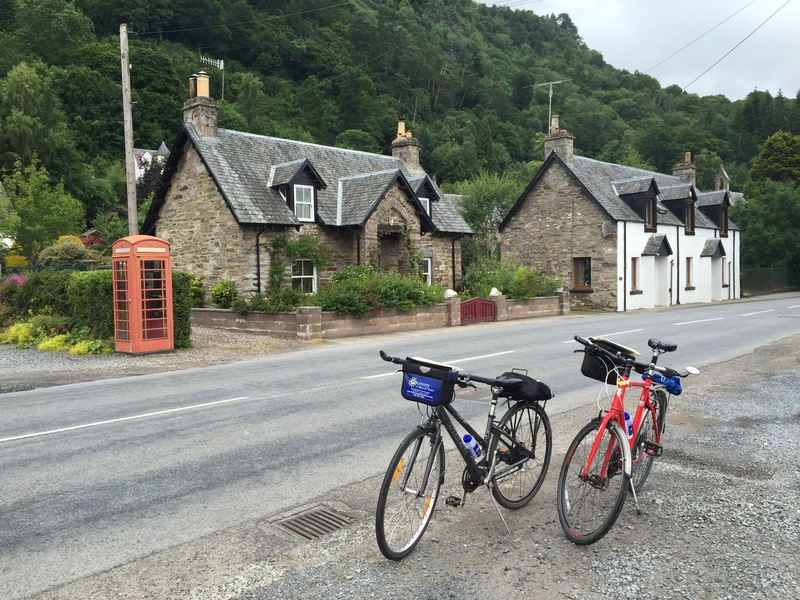 We rolled into Kenmore at 6pm, where we stayed at the Kenmore Hotel – the oldest inn in Scotland. It has been a source of Scottish hospitality, first as a tavern and then as a hotel, since 1502. It is definitely an old inn, but it had its charms and the best bath towels I’ve had at any hotel! It was a great place to rest up and get ready for Day 4.